NDUBUISI ARUM AND ALL IPOB ARE NOT TERRORIST, NIGERIA SHOULD BE CAREFUL. 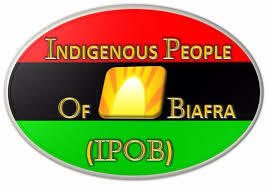 It is noteworthy that amnesty international recently affirmed the peaceful nature of members of the indigenous people of Biafra IPOB and has demanded for an investigation on the killings against them by the Nigerian government armed forces and police. After DSS had failed to substantiate it's lies of discovering in a forest in Biafra land, about 50 shallow graves and the bodies of five Fulani herdsmen allegedly killed by members of IPOB, the Buhari special militia force has shifted into arresting Biafrans with the intention of forcing them into testifying against their leader Nnamdi KANU. Read this: BIAFRANS CANNOT BE INTIMIDATED... BUHARI MUST OBEY BIAFRA. It is very important at this point to it openly that the DSS in it's desperation to lie against IPOB have reduced itself from an agency of intelligence gathering to doing the job of CID and SARS (Nigerian police) which is suppose to tackle common street crimes like kidnapping, armed robbery and gun running. It is a shame that Buhari's government and his secret militias has no intelligence report on activities of boko haram Islamic sect and Fulani herdsmen terrorist who have ceaselessly carried out many terror attacks on innocent people. This DSS has shown to the whole world the level of privatization of the security agency by Buhari against political oppositions in the name of hunting criminals. It has come to the notice of the indigenous people of Biafra, the high level of secret assassination and kidnapping of its members by the Nigerian military and the DSS. Last week, the national coordinator of of IPOB in the name of Mr Chidiebere Onwudiwe was forcefully kidnapped by the DSS in his home in the name of hunting the terrorist activity of IPOB during this salah period. The DSS have no evidence to prove to the world how or when this innocent young man engaged himself in such activity. It might interest the world to know that Mr Chidiebere Onwudiwe is a mechanical engineer and is just busy working hard to improve his life and that of his family. He is a law abiding gentleman and as an IPOB member, cannot engage himself in such violent activity. RELATED ARTICLE: THE SHAMBOLIC TOUTS CALLED DSS SHOULD GROW UP...You Are A Disgrace to secret Intel. Also Mr Ndubuisi Arum popularity known as High Chief was kidnapped by the Nigerian army on Friday July 1st 2016 around 10pm in the night in his house, till now all efforts to know his way about and which army command came for his arrest was to no avail as all of them have denied knowing his way about. In this Buhari's administration, the indigenous people of Biafra have been provoked in so many ways through it's army, DSS, police etc. Also IPOB have been tempted to abandon it's strong non violence avowal and methodology but have resisted them all. The indigenous people of Biafra have decided to exercise every peaceful approach to seek for her self determination, and should not be viewed as coward. Engineer Chidiebere Onwudiwe is not a terrorist, Mr Ndubuisi Arum, a successful businessman from Awkunano Enugu south is not a terrorist. All the IPOB members detained by Nigeria security agencies are not terrorists and as such should be allowed to express their fundamental human Rights. The Nigerian government lead by Muhammadu Buhari must account for the killing of innocent and peaceful Biafrans seeking for their freedom. Every acts of criminal stigmatization against IPOB, by the unprofessional and unfriendly DSS will fail woefully. True Biafrans shall never be cajoled to testify against their leader Nnamdi KANU [POS] whose continuous incarceration in prison has brought Nigeria to total anarchy and collapse.